Garden Thieves Pictures recently announced the upcoming release of "Rude Dude". The film follows the toll it takes on Dude and his family when he decides to leave the comic book field that made him famous to pursue a career in fine art. Special features on the DVD include two feature-length commentaries (director Ian Fischer and composer Ross Williams, Nexus co-creator Mike Baron) and a gallery of Steve Rude's sketchbooks. "Rude Dude" hits stores and VOD on October 7th. For more information on this film, you can visit the film's official Facebook page at: https://www.facebook.com/RudeDudeDocumentary. Garden Thieves Pictures has announced that Rude Dude, Ian Fischer's documentary about comic book legend Steve Rude, will be available nationwide on cable and internet VOD and DVD October 7th. The film, which has screened to audience acclaim at comic conventions across the country, follows the toll it takes on Dude and his family when he decides to leave the comic book field that made him famous to pursue a career in fine art. Possessed of an incredible artistic talent, Steve Rude is "The Dude," an eccentric personality as colorful as his comic book art. Filmmaker Ian Fischer (Magritte Moment) presents Rude's rise through the comic book world and difficult transition from comic book shops to art gallery walls, made all the more challenging by Rude's battles with mental illness. Rude Dude is a deeply moving portrayal of a talented yet tortured artist. The film is surprisingly honest in how it shows the impact that his illness has had on his family, his colleagues in the comic book world, and his ever-dwindling set of friends. 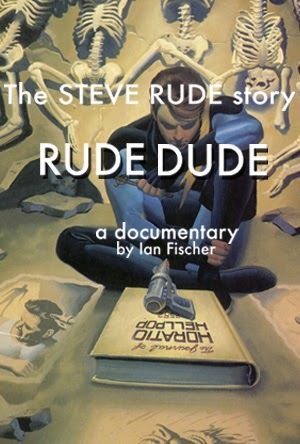 The DVD release of Rude Dude (SRP $24.99) will exclusively include two feature-length commentaries (director Ian Fischer and composer Ross Williams, Nexus co-creator Mike Baron) and a gallery of Steve Rude's sketchbooks.